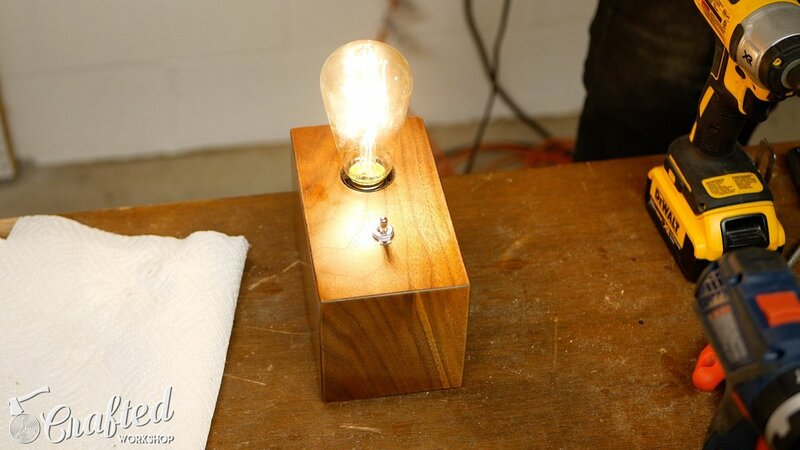 In this video, I show you how to build a DIY Edison Bulb Lamp. 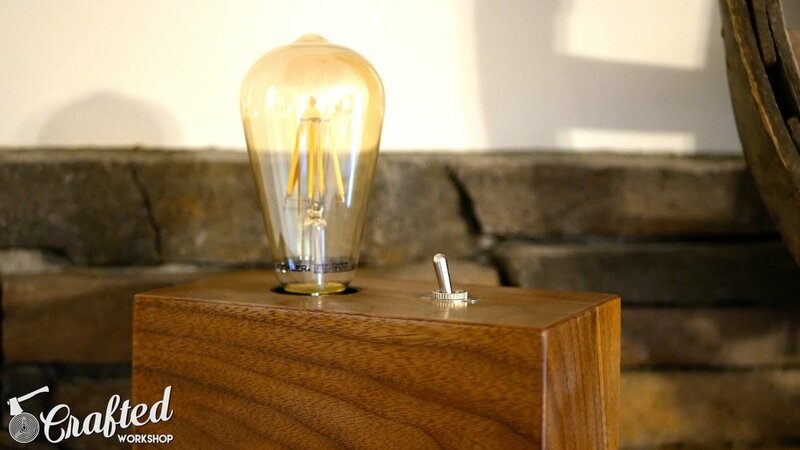 My Edison Bulb Lamp is built from Walnut, but you could use any type of wood. This is a relatively simple build and the result is a super cool, vintage looking lamp. Enjoy! After cleaning out part of my garage recently, I realized I’ve had this IKEA lamp sitting there for about a year now. I don’t really like the style of the lamp and I figured I could upcycle it into something I liked. I took the lamp apart, which was a pretty simple process. The main things I wanted to salvage were the light socket and the cord. I knew I was going to be using a different switch for my Edison Bulb Lamp, so I didn’t worry about trying to keep that. If you don’t have a similar lamp to disassemble, I have links above to a similar socket and cord. Just make sure you don’t have a socket with a switch built in if you’re building this style of lamp. 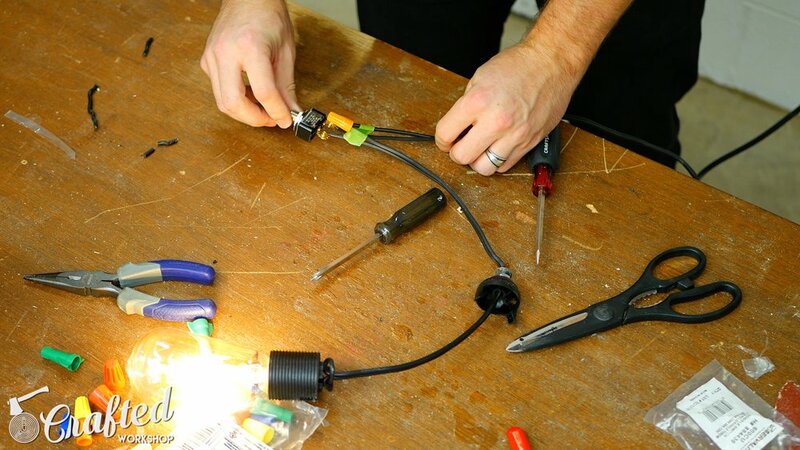 Once the lamp was disassembled, it was time to test the circuit. For the switch, I used a simple on/off toggle switch. This is an extremely simple circuit, even for one as electrically challenged as myself. Basically, there are two wires coming from the plug, a hot and neutral. The hot is wired to the toggle switch, and the switch dictates whether or not the bulb receives power. That’s it, as I said, really simple. The bulb is another big key to this whole lamp design. I used an LED Edison bulb. LED bulbs generate almost no heat, so I didn’t have to worry about that as part of the design process. Once I verified the circuit worked, it was time to build the box. I used a few offcuts of walnut I had on hand, but you could just as easily use any of the hardwoods from your local home center. If you were going to build this with a stock wood size, I’d go for a 1x6. The size of the box is roughly 7 inches long by 4 inches tall by 4 inches wide. I cut the 45 degree angles on the long side pieces and top at the miter saw, then made the rest of my cuts at the table saw. You want 45 degree cuts on every edge except for the bottom of the sides. The top has 45 degree cuts on each side and the sides have 45 degree cuts on three of their four sides. Once you have all your angles cut, verify that they fit together nicely, then cut a rabbet on the bottom of the side pieces. This rabbet will accept a piece of ¼” plywood. Make one pass, move the fence over, then make another pass. This will get you your ¼” rabbet with an ⅛” blade. Next, I drilled the holes in the top. I marked the center widthwise and then spaced the holes for the bulb and the switch evenly lengthwise. 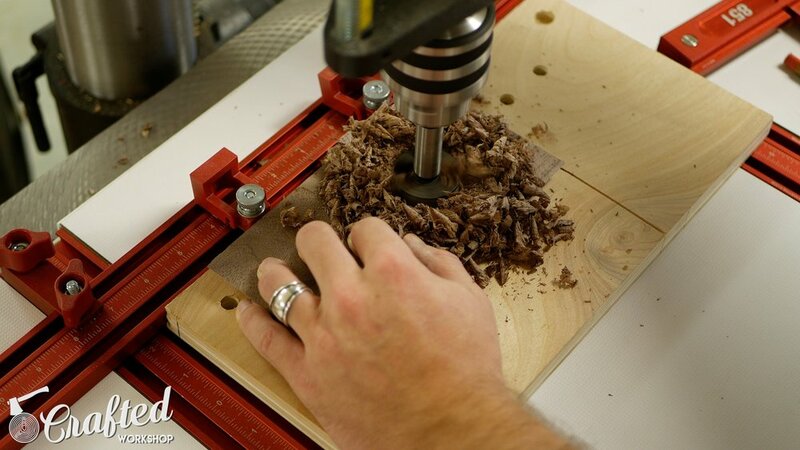 One tip: if you’re using a hardwood, make sure to slow down your RPM when drilling the 1 ⅝” hole. I drilled the holes with 1 ⅝” and ½” Forstner bits. I used a drill press, but you could just as easily use a handheld drill. Time for the glue up! I used the blue tape method, and this is the first time I’ve tried this. I made the mistake of using clamps on top of the blue tape. This ended up skewing a few of my corners which I later had to fill in. Just use blue tape and make sure each corner is tight, it generates plenty of clamping pressure to close up the joints. After the glue dried, I sanded the edges, rounded over the corners with an ⅛” radius roundover bit, then filled in any gaps with Timbermate wood filler. I let that dry and then did some more sanding, working my way up from 80 grit to 180 grit. For finish, I decided to use amber shellac. I had some trouble with the finish going on unevenly and, if I were to use this again, I would thin it with denatured alcohol and apply with a rag or bristle brush instead of a foam brush. The nice thing about shellac is that the follow up coats actually dissolve into the previous coats, making shellac very simple to apply. 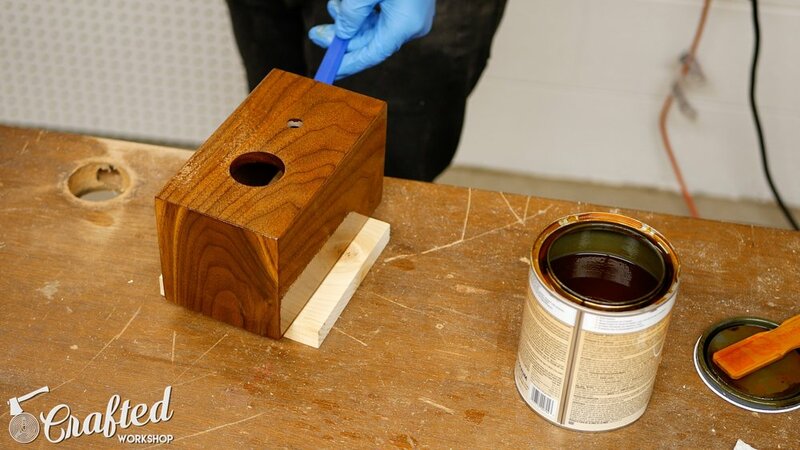 I sanded between coats with 320 grit sandpaper and used about four coats in total. For the bottom, I used a scrap piece of ¼” plywood that already had some stain applied. I drilled a few holes for these small oak buttons I got at the home center, and used them as feet. I glued them into place. During final assembly, I cut a small notch in the bottom panel using a coping saw to allow the cord to run out, and then installed the socket into the top using CA glue. I would not do this again, though. As it turns out, the accelerator for CA glue is made of alcohol. As soon as I sprayed it onto the lamp, the finish bubbled up. Disastrous, to say the least! I fixed it with a little elbow grease, scrapping off the bubbled portion then buffing it with 0000 steel wool and paste wax, but I would just use epoxy if I were using shellac finish. Once the socket was glued in place, I attached the toggle switch, then closed up the bottom using a few screws. Once the bottom is installed, the lamp is done!